Most households – especially those with children in them – do some type of decorating during the winter holiday season. Whether for Christmas, Hanukkah, Kwanzaa or simply to celebrate the natural beauty of winter, winter holiday decorations can be costly and consume a lot of natural resources. To make your holiday decorating more eco-friendly this year, consider taking advantage of some of these natural holiday decorations. One of the easiest natural holiday decorations to make a beautiful holiday wreath or table centerpiece is by intertwining several twigs and evergreen branches together from the trees and bushes on your own property. Not only do the branches provide a nice holiday fragrance in your home, but careful selection of the right branches will also take early care of your spring pruning. 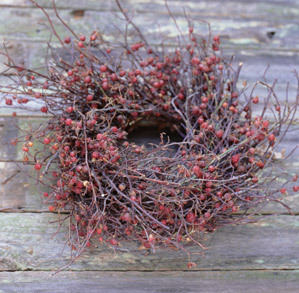 Top off the wreaths and centerpieces with fresh berries, pinecones or dried flowers. Many candles and scented sprays are harmful to the environment and are not part of a green lifestyle. To achieve a beautiful holiday scent without the use of chemicals, consider placing a pot of hot cider and cinnamon sticks on the stove to simmer and fill your home with holiday scents. Instead of buying rolls of paper to wrap holiday gifts, gather your children together to make homemade wrapping paper. The project is easy and fun for the whole family. To get started, find a source of recycled brown paper and let your children decorate the paper with glitter and colorful messages. Finish gifts off by tying them with raffia instead of using tape. Garland is everywhere during the winter holiday season. Get the kids involved by making your own holiday garland that also happens to be edible and biodegradable – unlike other store-bought varieties. To make it, pop several bowls of popcorn and string it together. You can also alternate the popcorn with dried berries and origami ornaments.